+ Most realistic offering of a shotgun on the market to date. +Identical operation to real shotgun. + Highest BB count per shot of airsoft shotguns. + Low power wont have people claiming overkill. + Similar operating mechanism to real shotgun. + CO2 Propellant makes it resistant to cold weather. + Shell catcher avoids damage and fouling of shells. - Low power and no HopUp makes it useless past 20 meters. - Parts of fired shell are disposable. - Loading individual shells is time consuming. If realism and an amazing firing experience is what you're after. 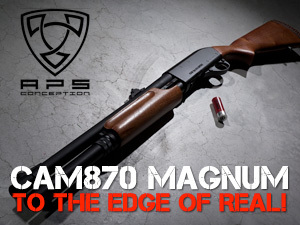 The APS CAM870 Magnum is the shotgun for you. If you're looking for skirmishablility, consider other options such as the Marushin M500 or the Tokyo Marui M870. 1. Concern for fact or reality and rejection of the impractical and visionary. 2. a: A doctrine that universals exist outside the mind: specifically : The conception that an abstract term names an independent and unitary reality. b: Theory that objects of sense perception or cognition exist independently of the mind. 3. The theory or practice in art and literature to nature or real life and to accurate representation without idealization. - Credits: Merriam Webster Dictionary. Why do we play airsoft in preference to other team based combat sports? When given the correct condition, site and player base, the sensation that we get from the combination of teamwork and immersion into the scenario appeals to us. But why airsoft, and not some run and gun splatterfest of paintball? There are several reasons that each sport attracts different types of people, and that some people enjoy both. But to many, it is because of the many parallels airsoft draws with real, modern day combat. The keyword here is 'realism'. Most all airsoft replicas make strives for realism to a great degree, starting with the external appearance and dimensions, extending to the materials used and the aesthetic finish, and in extreme cases compatibility with realistic aftermarket parts identical user operation. The APS CAM870 Magnum is no exception to this, with the aesthetics mirroring a real M870, full metal zinc alloy body, real wood furniture and shell loaded, shell ejecting operation. However, the APS CAM870 Magnum airsoft shotgun sets out with an arguably impractical and visionary goal of creating the most realistic airsoft shotgun ever, going to greater lengths in order to achieve such a goal. One could call such an ambition; unrealistic. Yet today, we see the fruits of such an unrealistic project and in hindsight, the execution is surprisingly simple. Why change what works if it works well? There is no reason to reinvent the wheel (shotgun) especially when the pump action is renowned to be a reliable and effective system. So that's precisely what APS has done. The APS CAM870 Magnum is the most realistic airsoft shotgun to date because it takes its design concept directly from the real M870. They key difference: The propellant in the shell is now a non combusting CO2 reservoir. Unparalleled realism in function and operation. 12 BBs per shot gives it the highest BB per shot count of all airsoft shotguns excluding moscarts. Even with high pressure CO2, the shotgun gives an indoor-friendly 280 FPS. A real shotgun shell utilizes a shot cup to effectively propel the desired projectile downrange. Should the shot sit in front of any propellant on its own, the expanding gasses of the burning propellant would seep past the gaps between the shot. This would be inefficient and not get the shot very far. 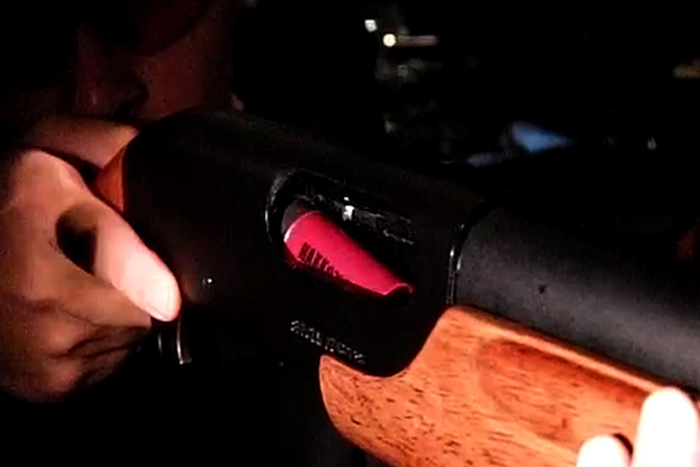 With a shot cup to provide a seal against the barrel walls and push the shot down the barrel, the effectiveness of the shotgun shell is vastly improved. It is this same concept that allows the APS CAM870 Magnum to excel in the area of realism. It has the greatest number of pellets per shot than any other airsoft shotgun (ignoring 40mm Moscarts) available today. The airsoft gun comes with cheap, disposable plastic shot cups (dubbed "wads" by APS) that act as vessels for up to 12 BBs to be fired down the barrel at once by the compressed CO2. It is true to the shotgun namesake. The uncompromising effort to create an accurate representation of a real shotgun that APS have put into the CAM870 Magnum stands as a statement to others, that unparalleled realism is a realistic goal.